Here are some recordings and photos from my June 19 show at Sedition Gallery in Sydney, Australia. The performance was part of the Left Coast Festival 2010. 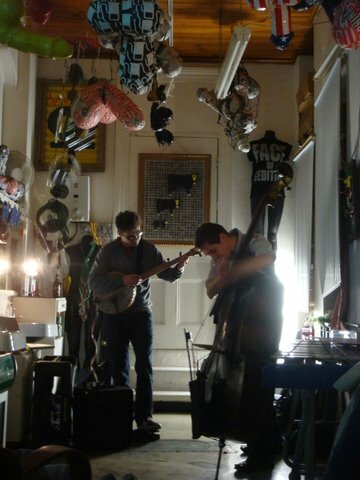 The first set consisted of duo improvisations by Holland Hopson, fretless banjo and electronics with Mike Majkowski, double bass. 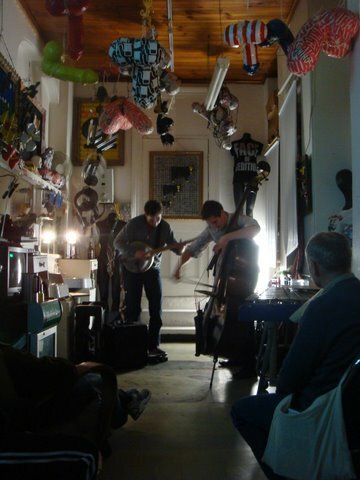 Next was a wonderful set by Kraig Grady, just tuned vibraphone and Terumi Narushima, just tuned pump organ. On Thursday, June 17 at 7pm I’ll perform Life on (Planet) for 2 rocks and computer. The concert will be at the Australian Broadcasting Corporation’s Eugene Goossens Hall. The featured performers are Ensemble Offspring. On Friday, June 18 at 5:30 pm I’m performing a set of works for banjo and electronics. The concert will be on the University of Technology Sydney campus at the Bon Marche Studio. Then I’m excited to play with bassist Mike Majkowski on Saturday, June 19 at 7pm. We”ll improvise together as part of the Left Coast Festival 2010 at the Sedition Gallery. The gallery is apparently a working barber shop by day–sounds like a unique venue. Throw in a Dorkbot gathering, the usual conference geekery, and some sightseeing and this should be a busy busy trip.